Since the beginning of the year, we’ve been streaming video of our Tech Field Day presentations on Facebook Live in addition to our web site. All this time, we’ve been advising our presenting companies to share our Live video post to increase viewership. Although it’s obvious that this would increase viewership, we thought we would share some hard numbers to prove it. The bubble chart above shows what happens when companies share our Live event video posts: Reach and viewership dramatically improves. Our “baseline” is indicated as one share and colored gray. Additional shares uniformly increase reach and viewership. Our best-performing video posts had at least two additional shares, with that one purple bubble shared 8 times and generating over 600 video views. Over the last five events, our own posts sharing a Live Tech Field Day presentation video generated a median 623 “people reached” and 108 “video views”, according to Facebook. This is pretty strong, considering this is a single post to our Tech Field Day Facebook page. With 1,370 “follows” currently, this means that nearly half of our audience has each Live video added to their stream, and over 10% are watching at least some portion of it. Each additional share generates about 525 more “reach” and 114 more “views”. In other words, a single share will likely double the views for a Live video post! Yet 12 of the 29 video posts included in this study were not shared by the companies presenting. But it’s not too late! This is “evergreen” content, and we have seen excellent viewership of these videos months and even years after the event. All it takes is a fresh share! Interestingly, Facebook “clicks” seem to require post shares. This is logical, since a post share shows differently in the timeline, encouraging a click. But even page posts generate a few clicks: Our median click rate is 2.4 per Live video post. What happens when a company, person, or page shares a Live video post? Median clicks went up by an amazing 25 per post, excluding our 2.4. 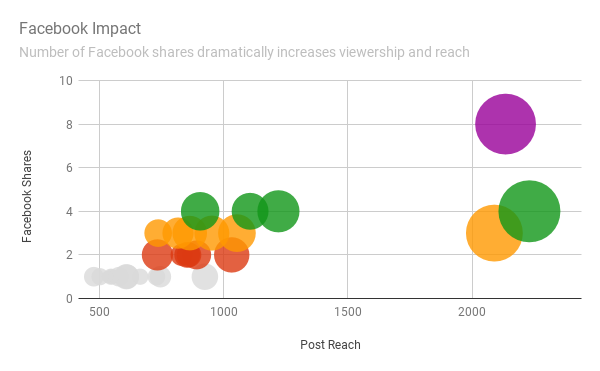 This shows the impact of a shared post in a stream, with different behavior on the part of Facebook users. We were skeptical about using Facebook for the enterprise IT content from Tech Field Day. But the viewership of our videos is incredibly strong. That’s why we added Facebook Live video to our page, and why we’ll continue working in Facebook to engage our Field Day audience. This study includes 29 full presentations at five Field Day events in 2017. Overall, there were 5,753 video views and 26,796 “reach” for these posts.